Since the beginning of the conflict in eastern Ukraine there have been many demonstrations in support of civilians and calling for an end to military activity. 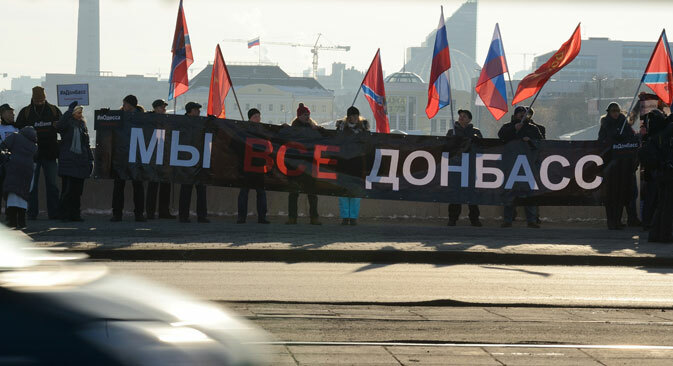 RBTH reports on the most memorable peaceful demonstrations that have taken place in Russia lately. In the last few months, as the war between government troops and pro-autonomy rebels in Ukraine’s Donbass region has escalated, a growing number of Russian citizens have reacted to what they see as unacceptable and tragic events by organizing peaceful protests against the conflict, from online demonstrations to lighting candles and even weaving rugs. RBTH reports on a number of these peaceful demonstrations and how society is participating. Darina Zabludovskaya, one of the demonstration's organizers, told RBTH that she thinks "Flames of Irene" has the potential to reduce the level of aggression in society. "A demonstration of care with the help of lighting candles is the creation of a new type of polemics. It is important to stop the war in peoples' minds," she said. Denis Volkov, a sociologist from the Levada Center, told RBTH that usually people come together in groups to solve their most critical problems, and few people really think about the common good – hence the limited scope of anti-war demonstrations.